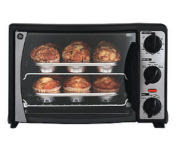 SavingYourCents : My Toaster Oven Vs. My Electric Oven WHICH IS BETTER? For those of you who have or are in the market of buying a toaster oven...this article is for you! I usually use my oven around an estimated 4 times per week! Each time I have to preheat it (about 5-10 minutes depending on the temp) and cook in it (on average about 45 minutes each time but could be anywhere from 30 minutes to 2 hours depending on the food I'm cooking). Prior to the toaster oven I have now...my last toaster oven was a fairly small one with only one shelf, only allowing me to cook english muffins or garlic toasts etc. My mother purchased a GE toaster oven w/ roasting abilities but it ended up being too big for her counter space. She offered it to me and I took it! It has become a life saver:)! Since last March, I have only turned my regular electric oven on 3 times to cook in bulk. This has saved me tons of money on electricity alone. Each time you use a regular oven in the summer, not only are you using up electricity to run the oven but you are making your air conditioner work harder to keep the air cool as the oven throws off some serious heat while it is turned on! My toaster oven takes the same time to cook as the regular oven and uses far less energy to run and doesn't heat up the kitchen either! If you are in the market for a new toaster oven, I highly suggest going bigger (if you have the counter room) to accommodate cooking full meals in them. Note: I would still check around on one that will suit your taste and individual needs. Companies are constantly coming out with new models to accommodate what they think customers want! It was only $49.95 in Wal-Mart. Great Price! It takes up a lot of room on the counter. The glass door has to swing all the way out in order for you to pull the pans out or put them in. The outside of the oven does get hot to the touch, you shouldn't have anything near it or on it while cooking! Accessories that come with it! 2 cookie sheets that hold 9-12 medium cookies each. Drip pan and broiler rack. I have this one, have had it for more than 3yrs and think I've only used it twice to heat up taco shells. I'm afraid it won't cook like my regular oven. I did see that Paula Deen has this one too!